Charles Boyer played his first major Hollywood role (and gets to sing in the bargain!) in the oddball musical romance Caravan. A miscast Loretta Young stars as young Countess Wilms, who is forced to wed by midnight or lose her inheritance. She impulsively chooses gypsy vagabond Latzi (Boyer), offering him a huge sum of money if he'll consent. Swallowing his pride, Latzi agrees to the marriage, but soon the coy Countess falls in love with young Lieutenant Von Tokay (Philips Holmes) -- who is himself in love with Latzi's gypsy sweetheart Tinka (Jean Parker). Director Erik Charrell, famed for his European musical productions (notably Congress Dances), seems uncomfortable adapting to the Hollywood movie-making process. 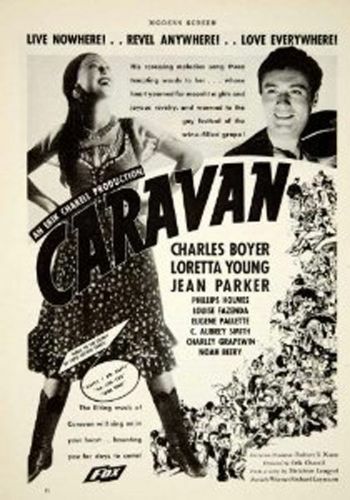 Though evidently intended to be taken seriously, there are times that Caravan comes off like a parody of operettas: one half expects the stars to join in a duet of Cole Porter's spoofish "Wunderbar."